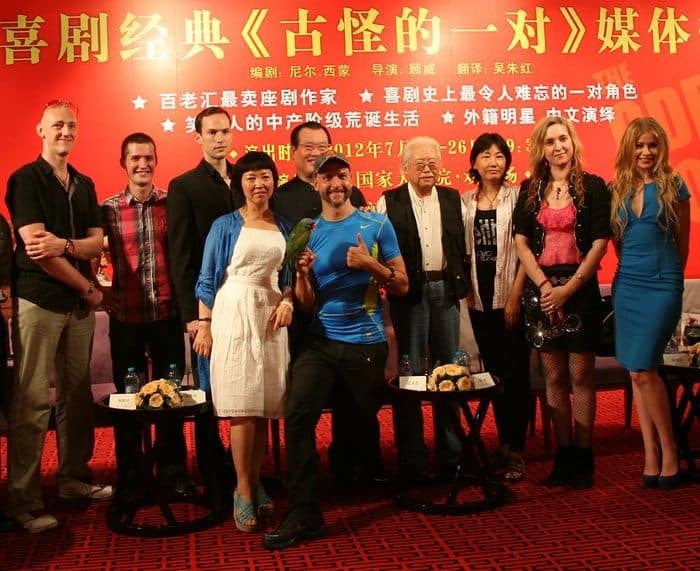 On July 18, 2012, in Beijing, China, eight Western actors, and crew, gathered for a press conference representing an all Mandarin version and production of The Odd Couple at the National Centre for the Performing Arts. According to actor Georg Anton’s source, this is a global first time ever event where eight “foreign” actors and actresses from seven different countries, including renowned Chinese director Gu Wei, take on an all Mandarin version of Neil Simon’s Broadway comedy classic, The Odd Couple, at China’s National Centre for the Performing Arts. The cast, with Caucasian looks, was chosen to portray the story set in New York. The concept and production are completely Chinese, managed by the Hebei Theater Company. This is a groundbreaking attempt to reach the Chinese audience through their own language while keeping the original story from abroad as authentic as possible. The eight Chinese-speaking American and European performers come from all walks of life, representing the colorful community of China-based foreigners. While only some of them are professional actors, it is the combination of Mandarin skills and their different stage, TV, or entertainment backgrounds that makes each of them suitable for this pioneering theater project. Georg Anton, an actor from Austria who is seen in many recent Chinese film and TV productions, plays Speed, the story’s gruff, sarcastic poker buddy. 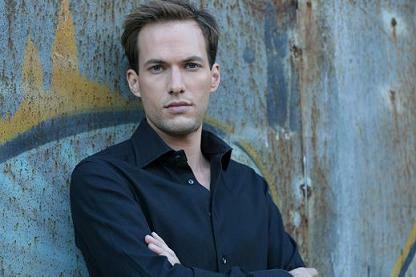 Georg Anton is a Beijing-based actor from Austria. Within less than two years Anton starred in six TV series, three TV films and four movies in several principal and lead roles. 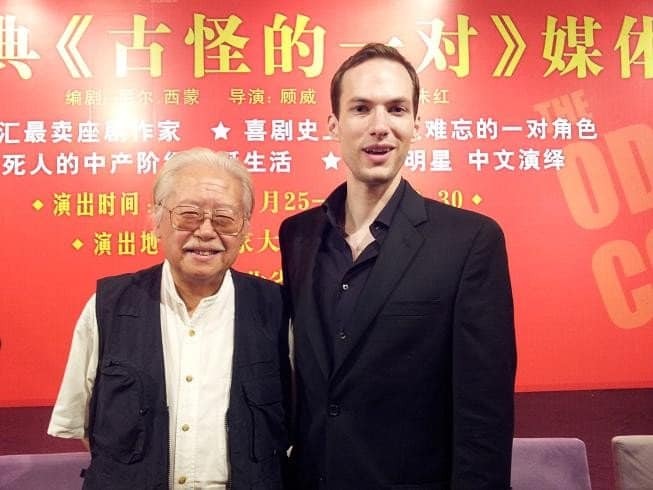 Anton is also an active part of Beijing’s theater and indie film communities and a longtime member of Beijing Improv’s English Performance Troupe. In 2012 Mr. Anton was selected as the lead actor for China in the U.S. produced worldwide collaborative film project, Train Station. Georg speaks five languages and is often seen portraying Americans in his work. “The play, with its delicate plot, vivid characters and strong comic effects, will open a new window on quality comedies for the Chinese audience. It is different from prevalent Chinese comedies that sometimes win a laugh with vulgarity. There will be a performance of The Odd Couple on China’s top ranking theater stage at the National Centre for the Performing Arts (NCPA) in Beijing for its premiere on July 25th and another performance on the 26th.